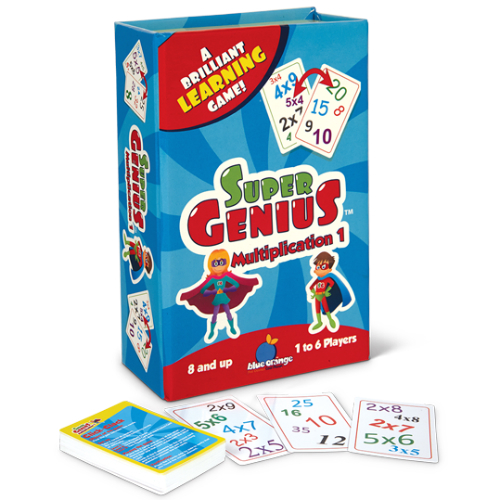 Motivate your little genius to learn their times-tables while matching multiplication factors to their final products and have a great time doing it!. 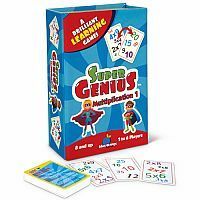 Super Genius Multiplication 1 is a multiplication matching game which focuses on single-unit multiplication equations (from 2 to 5) and helps prepare early learners for more complicated arithmetic to come. Find the pair between an equation and its product, two equations or two products. Like the popular game, Spot It!, there is alway a match between any 2 cards. Be the first to spot a match and claim the pair. For 1 to 6 players. Measures approximately: 3.25 x 4.75 x 1.50 inches..